A nation watched as North Carolina braced for massive Hurricane Florence to swell rivers, uproot trees, and flood cities. Starting on September 14, 2018, evacuated residents huddled by television screens to assess the damages and losses of their property. A life time of memories, dreams and work now under water. Only time would tell how much reconstruction would be required to bring a home back again. When a disaster strikes, many times help rises from a strong arts and craft community. 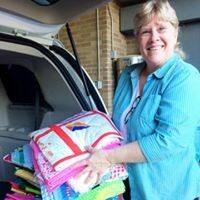 In the midst of an emergency, there are those who bring out their stashes of premade quilts. 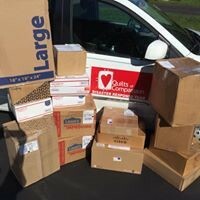 Other fabric artists dive into their stacks of fabrics in an effort to create unique comforters to be sent to survivors of tragedy. Hurricane Florence in the Carolinas has beckoned to those who wield healing with fabric, needle and thread to stitch up hope. To help piece life back together. Quilts matter in disasters. The warmth that they supply to a child or elder left exposed to the elements by flood is life giving, literally. 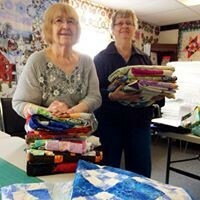 Taking a group of quilters to a community hall after a flood gives those women who have lost family heirlooms a chance to create beauty from the stashes of donated material. Working with another woman on a sewing machine and telling the story of emotions and loss is healing. The act of stitching gets women back to useful work and focused. As they sew swaths of material together, they begin to shape the pieces of their world back into familiar, coherent patterns. These are the types of ‘ties that bind’ in a period of crisis. As the waters of Hurricane Florence recede, one quilt at a time, or even en masse, people find hope and comfort by wrapping themselves in fabric love. Karen Overby Reynolds remembers that among the flood victims are babies. As a sew-er, she has a recommendation. “The self binding flannel receiving blankets are so very easy and fast to make. They are incredibly useful, practical, warm, cute, perfect size and can be thrown in the wash frequently. I have some already made… Must think of those precious babies and their moms!” It is easy to imagine the joy of a flood ravaged mother when she wraps her precious child in a new blanket that will soothe and comfort. Across this country there are impassioned, generous people who are fabric artists. Those whose giftedness is creating beauty from scraps are needed in a flood, hurricane, fire, earthquake, tsunami, or tornado. Quilts represent the essence of physical renewal as well as a connection to people who care. They are the means for healing. 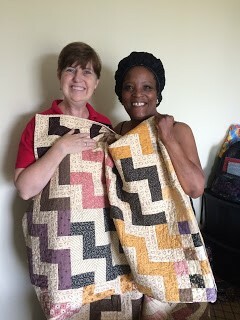 Quilts wrap a person into a fabric hug stitched with cared and love. disaster quilts, Hurricane Florence, Quilts of Compassion. Bookmark.